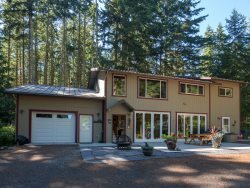 A perfect retreat or home-base for 1 or 2 guests while exploring the North Olympic Peninsula. Located close to Cline spit, Clallam Bay Park and Dungeness Wild Life Refuge, this area is included in many bicyclists' favorite routes. As you enter the studio the large sofa and lounge chair provide comfortable seating in front of the built-in propane fire place with remote. A large, wall mounted flat screen TV has cable service for you to watch your favorite shows. The studio has high-speed WiFi (240). This makes Sunset Studio a great retreat for travelers working remotely. Prepare your favorite meals in the kitchen with the full sized refrigerator, stove/oven, and a microwave for on-the-go meals, while you enjoy the light streaming in from two walls of windows. Enjoy your morning coffee at the dining table set in front of the large wall of windows facing north toward the Straits of Juan de Fuca. After a long day of exploring, bicycling, or beach combing, sleep comfortably on the king-sized sleeper sofa bed. Great service and appreciated extra help and recommendations. Wonderful stay. Beautiful property. Convenient and close to everything. Had a great stay! Amazing area, so much to do! Very nice and cosy studio with a very good equipped kitchen with everything you need. The sofa bed is kingsize and very comfy. The studio has got big windows and it feels like sitting outside under trees - very relaxing and calm. The studio is located close to Marine Dr and you could have nice evening walks with amazing views of the Dungeness Spit, Vancouver Island and San Juan Islands during sunset. The location is great! Really close to the water. The space is cozy, but it had everything we needed for a long weekend. I highly recommend this place!